The government shut down has affected so many under it’s jurisdiction, one of the greatest impacts falling on the U.S. Merchant Marine Academy in Kings Point, N.Y. — also, the school my brother is attending. Monday, September 30th, the school celebrated it’s 70 year anniversary. On Tuesday, the school completely shut down. Unlike the other military schools, the U.S. Merchant Marine Academy is under the Department of Transportation, not the Department of Defense, which is why it was so greatly affected. During a Government shut down, all civilian personnel receive furlough (a temporary layoff from work) and must leave the premises until further notice. And since the vast majority of teachers at the U.S. 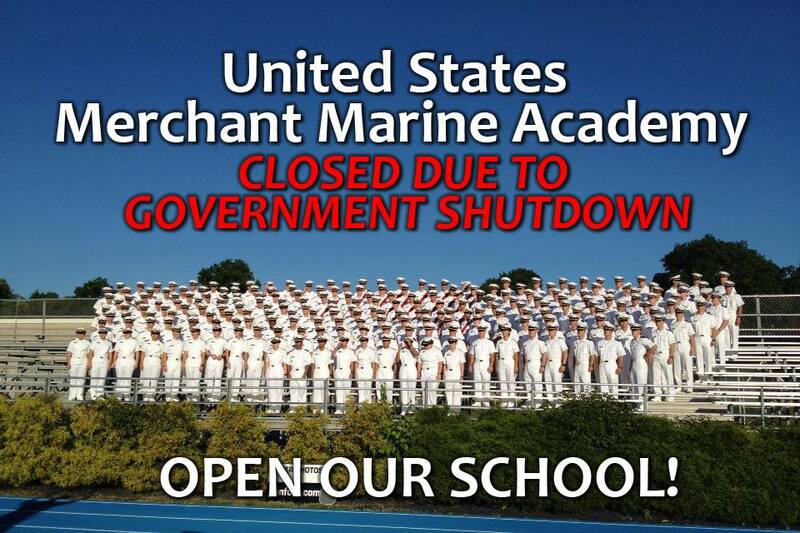 Merchant Marine Academy are civilians, the school was forced to shut down, leaving hundreds of students in the air about their academic future. “We are kind of the forgotten academy,” Carol Kennedy told USA Today. Most people, from Senators to the boy next door, haven’t even heard of the U.S. Merchant Marine Academy until this week. The Merchant Mariners are deployed in either peace or war. They don’t have a role in combat, but rather, they protect any precious cargo, from supplies, to civilian passengers, to military troops. “During the events of 9/11, the U.S. Merchant Marine Academy assisted in the evacuation of civilians from Lower Manhattan as well as the transportation of first responders and supplies to and from Ground Zero.” Wikipedia writes, “. . within hours of the attack, [the Merchant Mariners] were using boats from the waterfront and sending them to the city.” Yet somehow, people don’t know of them. “Because the Academy’s academic calendar is nearly year-round, we have only 19 “break” days during the year to make up missed classes.” This was written on the USMMA web site. To keep on track with curriculum, the academy has decided to move fall break, which would have begun November 1st, to yesterday, October 4th. The break will run through until Monday, October 14th. Students are not being forced to leave campus but the option was given. Yesterday, students from all across the country had to decide whether to stay at school, with friends or relatives, or to come home. Parents pulled together to help drive students to airports, some even opening their homes to students not their own. As was the case with Kevin Gioino, a man who drove two hours from New Jersey to pick up his son, also his son’s friend, and then further volunteered to take as many and any students he could to the airport and train station. Kevin Gioino was the man who went way out of his way to first find my brother in the throng, and then drive him to the airport for us as well. He even called to let us know my brother was dropped off. Talk about going above and beyond the call of duty. We are thankful. So, within less than twenty-four hours, it was decided that my brother, Isaiah, would come home, as with many others. Parents and relatives are glad to have their family members back for this time. All over Facebook are candid shots of students, worn and in uniform, returning to crash on the couch, flop into lazy boys, and get some well-deserved rest. But the question still stands. Will the school reopen? USA Today wrote: “The situation has frustrated many including a now furious [Carol] Kennedy [her son scheduled to graduate within the year] who is hoping the U.S. Merchant Marine Academy will begin having classes soon. So many students, including my brother, have worked so hard and waited years to get to where they are today — to be in the U.S. Merchant Marine Academy. Q: What if the government is still shutdown at the end of fall break? A: Midshipman, faculty and staff should monitor the Academy website for updates and can stay informed by contacting the Command Duty Officer who is available 24-hours a day. While we hope the shutdown will be resolved by the end of the newly-scheduled break, if the shutdown is still in place, we will be forced to shut down the Academy on October 15. We are all praying this isn’t the case. If you can, please support this. Leave a comment and tell friends. Spread the word! Well written and very informative as not too many people even know that the USMMA exists. Keep up the good job.